We are have lots of different types of events here at Twin Oaks. Anniversary is one of my favorites, in part because it is a principally internal affair, with most of the guests being ex-members and the closer friends of community. This year was a smaller celebration (43 not being an especially significant number) and it was precious. 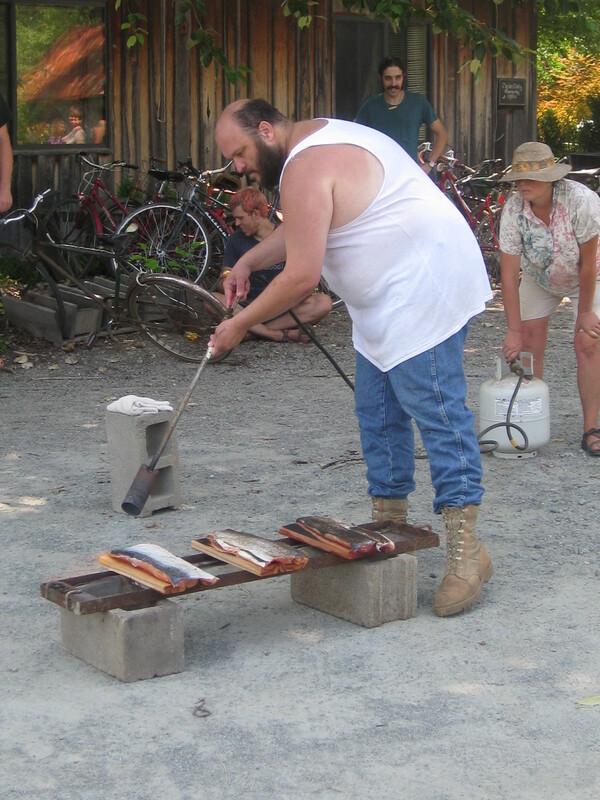 The weather cooperated, the home-grown entertainment (especially Uncle Trout’s Dead cover band) engaging, the food was glorious (see viz Rich’s fabled flame thrower salmon below) and our spirits were high. From a funological perspective, we even had our bonding crisis experience. For the last few songs of the Dead cover bands performance, the wind kicked up and what looked like a serious storm started to blow in. Communards, quick to help jumped up and deployed tarps. I had a precious moment dancing with Mushroom as we both held on of the canopy poles to the ground wrestling the storm winds. And in what perhaps typifies our collective response, as a handful of dancers moved in to secure the stage from the storm, other participants who had been sitting, instead fo getting out of the pending storm jumped up to take the dancers places. The storm blew past the revealers partied on. Anniversary was a good day. Hi Paxus (I hope that’s the preferred way to address you!) . . . I knew you when we were both living in Lincoln. Your dad designed our house on Laurel Drive, not very far from your childhood home. If you’d enjoy being in touch – let me know! I think I see a couple good friends of mine in those photos! Would you please send my love to Jas+Kel? I’d do it myself, but have no idea how to get ahold of those two! Hopefully my life will allow for time to get out there for a visit sometime in the next year or so.